Here you can check your subscription status, renew, change your address and report a missing or damaged issue. 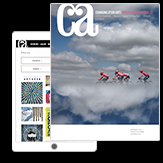 If you’re a current print subscriber, you’re also entitled to access PDF versions of your print issues, along with unlimited access to the Commarts website — 18,000 + award-winning images and videos. To find out how to add these features to your account, please visit our Digital Access page.